Daytona Beach having an identity crisis? Indeed – the place we dream has beaches miles long, all-day sunshine, and surf, is going through a makeover. While you can’t see it everywhere, this town, after years of being the number one Spring Break destination, is trying to upgrade its image. But leave it to Daytona Beach to find a way to make a beach, driving on the beach, an International race track, and hundreds of retirement style condos a World Class Destination. They’ll get it done. And do they have the beaches. Here we found 23 miles of wide beaches with hard-packed sand – and 18 of those miles are open to automobile traffic. That’s what put Daytona on the map – beach driving! Daytona Beach has become synonymous with Spring Break, so much so that MTV has come here since the ’80’s to broadcast from the beach and gave us the impression that Daytona Beach was one huge oceanside Animal House. Even though they still come in the thousands, the peak was in 1989, when over 400,000 students showed up. With only 20,000 hotel rooms – you do the math. The city has done a lot to change the image – trying to turn interest to the major-league baseball spring training and the Daytona Beach NASCAR racing event. Still, 200,000 come here each Spring Break, spaced out over a four to six week period. The most rowdy and wild party animals now call Panama City Beach up in Florida’s Panhandle their Spring Break home. The Beach – The 23 miles of beautiful sand starts at Ormond Beach and runs down to Ponce Inlet. In the middle sits Daytona Beach. This thing is spectacular at low tide. It’s almost 500 feet wide! Vehicles, including RV’s and trucks under 33′ are allowed on 18 of those 23 miles. We noted the sand here to be very fine. It’s of quartz origin and packs tightly. So hard is the sand that cars once raced here! But tourists can still drive (although no more than 10 mph) on the famous beach. 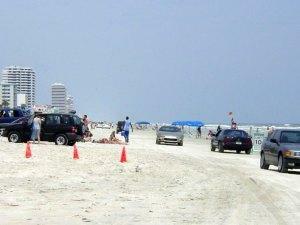 On a nice day, you’ll see over 10,000 vehicles roaming the beach. But more than cars, we saw volleyball, jogging, surfing, and bicycling. And swimming here is great. The bank slopes slightly so even little ones will enjoy the shallow water. 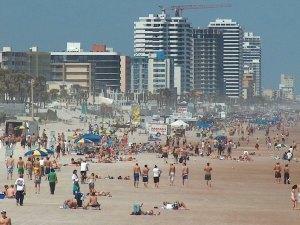 Watch for the waves – bodysurfing of Daytona Beach is the best in the state. Riptides do exist during times when the tide is going out. There are over 200 lifeguards watching over the beach – but take care. Rip currents are dangerous. Learn about surfing at Daytona Beach and the famous Daytona Beach Pier on our next update.